Today we’d like to introduce you to Natalie Kaplan. JR Dessert Bakery is a full-line dessert bakery in Chicago that’s been making gourmet desserts that look as good as they taste for more than 38 years. We pride ourselves on using high quality and all-natural ingredients in our baked goods. Our business is primarily wholesale. That means we cater to the dessert needs of hundreds of top restaurants, hotels, grocery stores, coffee shops and event venues around the Chicagoland area. We also welcome anyone with a sweet tooth into our West Roger’s Park store where customers can feast on a selection of daily specials. While our retail location might look small many customers don’t know that we have a 6,000 sq. ft. commercial kitchen in back with 20 employees. 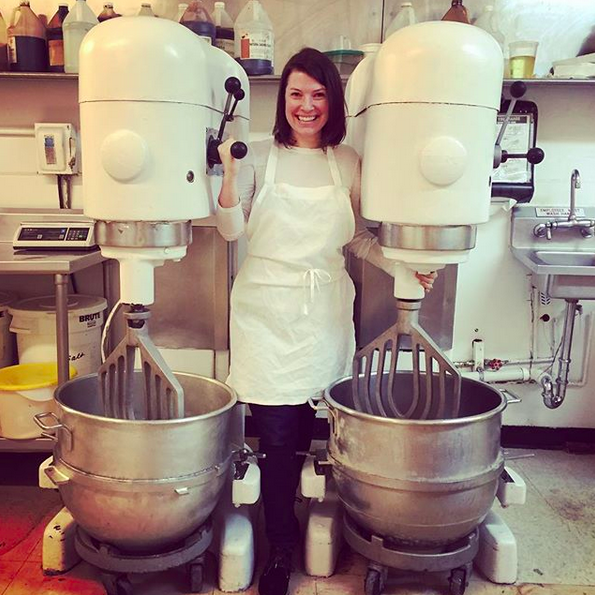 The bakery was originally founded in 1979 by my mother Janet Rosing, a graduate of Chicago’s Art Institute who always had a passion for baking. At the time there were very few bakeries doing what she did. She has always been a wonderful artist and that has translated into a creative dessert line. You can still find her running production every day. I have always been involved in my family’s business. I worked here during high school summers and ran our booth at the Taste of Chicago for years. However, I spent the first ten years of my professional career as a TV reporter and producer for various news stations around the country. I did not start working here full time until 2015 when my husband and I moved back to Chicago from Boston. My mom and I now run the bakery together. To say it has been a big change would be an understatement. However, being a part of a business that you are extremely passionate and dedicated to just feels right. The two of us – along with our dedicated team of bakers – work tirelessly, laugh often and taste test every day! I am in charge of all of our business development. I get to work closely with restaurants, owners, chefs and caterers designing perfect desserts for their menus. We have also been diving into the private label business. That means we develop products under other companies’ names. There are so many great opportunities out there for us that I’m constantly looking to explore. Running a small business has always been and will continue to be a big challenge. While we love and our passionate about what we do rising ingredient, labor and overhead costs are a huge concern. Just because you make a great product doesn’t mean you’re going to be able to run a successful business. The numbers matter and I’m constantly looking at ways to save, cut and become more efficient. We also now face a lot of competition. This means we need to stay current and keep working hard to bring in new business. Fortunately, the restaurant business is booming in Chicago. So, there are a lot of great opportunities out there for us. Please tell us about JR Dessert Bakery. Even though we’ve been in business since 1979, I’d like to think that our time is now! We’ve always been a handmade and all-natural bakery using the finest ingredients in all of our desserts. To us – that’s what has always been important. But now, that’s what’s important to everyone else too. Customers want to know what they are eating and where it was sourced from and we fit perfectly into the mix. We call ourselves a full-line dessert bakery specializing in cheesecakes, specialty cakes, Bundt cakes, cupcakes, individual desserts, pies, tarts, cookies, breakfast pastries, brownies and gluten free desserts. While we started off primarily serving cheesecake we’ve had to widely expand our menu to meet customer need. We cater to hundreds of restaurants, hotels, coffee shops, grocery stores, event venues and other food service businesses around the Chicagoland area. We supply everything from your neighborhood coffee shop to the hot new Chicago restaurant to large event spaces like Soldier Field and McCormick Place. I like to think that we’re also a great employer to work for. We greatly care about our employees – many of them have been with us for decades and are as invested in the business as we are. We train employees from scratch. Many of them come to us with absolutely no experience and leave an expert. But because our work is so specialized a high employee turnover, which is very common in the industry, would be detrimental to our business model. So, we try and do everything we can to keep them. I probably would have gone to business school. During college I took one economics, one accounting and one calculus class. If I had known I’d be taking over the business I would have actually paid attention. That said, I could always still go. I’ve had to teach myself a lot of the basics and there’s stills so much I don’t know. Address: 2841 W. Howard St.
Great article. What a fabulous business and so lucky to work with your mom every day! I have been lucky enough to try some of these sweet treats. Fabulous. Thanks Judy for the kind words. I’m shocked sometimes at how much my mom and I enjoy working together. It’s been a really nice aspect of the business! Have a great day.